This is my own very provisional translation. It would seem more logical to change the order to read: “teaching in this land and its surrounds is forbidden with a might prohibition,” but I do not see that in the text. The rule that Bahai do not teach their Faith in Israel goes back to the time of Baha’u’llah, and was confirmed by Abdu’l-Baha. There’s a short paper by Kavian Milani, in Persian, that quotes Baha’u’llah’s words, forbidding teaching in “Sham” (the Ottoman province of Syria which includes present-day Israel and Palestinian territories). However I don’t get a clear reason for the prohibition from the quotes. I don’t think anyone understands it – we obey because Baha’u’llah said so. It seems to be a permanent rule, only the boundaries of the area around the Bahai World Centre where there is no Bahai teaching activity have changed, as governments have come and gone. Nevertheless people did become Bahais in Palestine at that time, and there were small Bahai communities in various towns and villages in the north. However in the 1940’s, as the Israel/ Palestine conflict developed, Shoghi Effendi asked the whole Bahai community to emigrate. To this day, there are only a minimum staff serving at the Bahai shrines and gardens and in the offices there, there is no “Israel Bahai community” as such. People who do become Bahais are asked to leave. Again, so far as I know the reason has not been stated, but the Bahai teachings hardly favour the idea of a state that is designed primarily for people of one ethnic and religious identity. Bahais favour unity in diversity and the abandonment of prejudices of all kinds. Perhaps Shoghi Effendi’s decision was a quiet expression of disapproval for the zionist foundations of Israel (which I recognise today is much more diverse than just a zionist project). As a sidelight on this, at one time in the 1920’s there were rumours of plans to bury a leading zionist on Mount Carmel, and Shoghi Effendi was engaged in raising funds to buy land around the Bahai shrines to prevent it (See Ruhiyyih Khanum, The Priceless Pearl, p. 97). … Leave hath, moreover, been given to whosoever may desire to raise, throughout the length and breadth of this land, noble and imposing structures, and dedicate the rich and sacred territories adjoining the Jordan and its vicinity to the worship and service of the one true God, magnified be His glory, that the prophecies recorded by the Pen of the Most High in the sacred Scriptures may be fulfilled, and that which God, the Lord of all worlds, hath purposed in this most exalted, this most holy, this mighty, and wondrous Revelation may be made manifest. We have, of old, uttered these words: Spread thy skirt, O Jerusalem! Ponder this in your hearts, O people of Baha, and render thanks unto your Lord, the Expounder, the Most Manifest. Enlarge the place of thy tent, and let them stretch forth the curtains of thine habitations: spare not, lengthen thy cords, and strengthen thy stakes; For thou shalt break forth on the right hand and on the left; and thy seed shall inherit the Gentiles, and make the desolate cities to be inhabited. I have not discussed the geographical scope of the ban on ‘teaching’ (preaching, proclaiming) the Bahai Faith in Israel. The orginal word used, “Sham” includes presnt-day Syria, Israel, Gaza and the Palestinian territories, yet if we search in English or Persian we find explanations and policy guidance from the Universal House of Justice referring to Israel only. Does this mean that the scope has been narrowed? Or is it simply that the cases that arise and the questions that are put in English and Persian relate to pilgrims to present-day Israel and Bahai staff working there, so Israel is named. If guidance was given to Bahais living in or visiting Syria and the Palestinian territories, it would presumably be in Arabic, and might never be circulated beyond the family concerned. So I do not know what the present scope of the ban may be, except that it does not include Turkey or Jordan. I’ve realised that there’s a whole dimension to this question I’ve not covered here: the special agreements made between the state of Israel and individual religious communities, which have the force of law while not being legislation. I found a blog entry on the restrictions placed on Mormon teaching work. It would be interesting to know the contents of the special agreement between the Bahai International Community and the State of Israel. Why dont Bahais teach in Israel? very easy answer : whom made a poisonous food prohibit them selves and their familly to eat. Bahaism and domneism is made by international Jews to simply dis-effect Islam power, other wise which world religion(Islam, Christianity , yahoodi) have such prohibition? You just made this up, without evidence. If you had thought a little, you would realise that at the time this ban on teaching the Bahai Faith in Palestine was put in place, there were hardly any Jews living in Palestine. It was an Arabic country, ruled by Ottoman Turks. If the Bahai Faith really was made by international Jews to reduce Islamic power, surely they would want it preached among the Arabs of Palestine, above all. The Bahai Faith was created by Iranians: by the Bab and Baha’u’llah and Abdu’l-Baha. But it is very difficult for Iranians today to believe that something so good, so widely appreciated around the world, could have come from Iran. They say the Jews did it, the Russians did it, the British did it, the Freemasons did it … simply making up stories that have no logical plausibility or historical evidence, and all to avoid the plain fact: the Bahai Faith is one of Iran’s great gifts to the world. I believe that the Babis also has gone through slaughter of muslim at that time just before the construction of the surroundings shaykd Tabarsi tomb,the attempted murder against the head of Persia state and the great convulsion in Persia and Iraq caused by the birth of these revelations Bab and Bahaullah which I believe the negotiation between the by then authority in Israel and Shoghi Effendi to buy this plot of land following these events has let to the agreement ” teach not Bahai doctrines and have your plot of land on Mount Carmel”. Just to say that many verses inthe Bayan promote violence against non babi. There is no possibility at all that this was the reason, because the policy of not teaching the Faith in what is now Israel was established by Baha’u’llah, and the first land on Mount Carmel was not purchased until the time of Abdu’l-Baha. At the time Baha’u’llah arrived in Ottoman Palestine, and said that the Bahais should not teach in that area, neither he nor the Bahais owned any property, and they had no basis for negotiating anything with the Ottoman authorities: they were prisoners under close confinement. Sen.It’s just my opinion and supposition. Any way you are right to say that Bahaullah, who stated not to teached in now Israel, because after so many hardship exiled and the hostile crowd that welcomed the coming of the Family in Akka, may be Bahaullah decided to make a halt and enjoy some tranquility.But to promote the Bahai doctrine in this country which cause so much convulsion in Persia and Iraq would in no wise favored him and his family.And if He did so, may be again another exile.Don’t teach and there would be a win-win situation. It’s possible: Baha’u’llah must have had some purpose in mind, but if he ever stated it, I have not heard about it. From what we know about him, it is unlikely that the purpose was tranquility for himself. Perhaps he foresaw even then that the remains of the Bab would be taken to that area, and wanted tranquility for them and for the pilgrims who would come. The answer might be found in the Old Testament,and Koran where God made covenant with Israel,Jews etc.about their return from the Roman exile,as promised..God’s covenant with Jews etc. did not just dissapear….more to come it seems if one is to beleive these prophecies- Ezekial is a good source–36-39…What is now Israel is occupied Jewish lands-First by romans-later by arabs.Bahais have nothing to do with this -Just try and avoid what might happen the future..It looks to me as God is doing what he promised.. More exciting events in the making.. In the Quran, Surah 17:103-4, and Surah 5:21 reflect the same Old Testament idea, that the land of Israel is God’s gift to the children of Israel. However the idea that there exist separate races is a-historical. In fact, we are all mixtures. So the idea of a separate God-given destiny for a separate race never gets a foot on the ground. Moreover, the people who were displaced in the Naqba (Arabic-speaking people largely Muslims and some Christians) were largely descendants of people who converted to Islam, from Christianity and Judaism (and also remnants of Roman paganism, but I said ‘largely’). And their ancestors who converted from Christianity, were themselves largely descendants of people who converted to Judaism. What then is the difference in Jewishness, between the Jewish immigrants and the people they displaced? Does one have a greater claim to the promise than the other? One difference is that the Jewish immigrants had not converted to Christianity or Islam, which if you believe that the Torah and the Prophets is the Word, and Christianity and Islam are false religions, gives them a better right to be heirs of the promise. But if you think, as I do, that Judaism, Christianity and Islam are part of one “Faith of God” (which is ongoing), then the Jews are the group that rejected more Prophets, more consistently than the others. That’s an odd basis for a claim to inherit God’s promise. One could also say, the promise is given to the children of Israel, and the Jewish immigrants at least called themselves the children of Israel. But the Arab peoples trace their ancestry from the same line, and Israel today does not accept as a Jew, everyone who calls themselves Jewish – the Black Hebrews for example. For myself, it’s all a moot point, because modern states are not built on race or religion, but on the common citizenship of all residents in a geographical area. So if some people — be they Muslim or Jew, Arab-speaking or Hebrew-speaking or Bantu-speaking (the Lemba consider themselves Jewish) want to think they are heirs of the promise given to the children of Israel, that’s a private matter, as long as they do not fight each other about it. I don’t see any connection between this and the ban on teaching the Bahai Faith in Israel. I would relate that more to the Islamic background, in which the area around Mecca is a special zone in which special religious rules and practices apply. That Islamic background in turn reflects the Judaic background, where the Temple at Jerusalem and the priests who served in it had on some matters a special status with a different code of behaviour. We better have an exact tablet or message regarding the prohibition against teachings of the Faith in the boundary in the surrounding areas in Baha’I World Center in Israel, otherwise, we will keep on building ideas and arguments based on conjectures and suppositions. If we have the message/tablet then we can probably ascertain as well the date of the said message/tablet, its wisdom and the surrounding circumstances why the message was made and can draw a conclusion whether it is still sound to apply the same or it needs adjustments for the interest of expansion of Faith in that areas and that it will not pose a threat or setback for the the administration in the Baha’i World Center there and also of the whole faith as a whole. Right now, when we say that it is said that Baha’u’llah has said this and thatn, or some Baha’s did, are mere hearsay and speculative and to deal with it is a mere exercise of reason in futility. It may or may not have been said so please produce tangible proof of the existence of the message/tablet and we can discuss it in a scholarly and reasonable manner. It would be excellent to have the tablet, but I think it is not in any of the main collections of works, since I have used the search engine at the Bahai Reference Library to search for it (using الشام ). The nice thing about blogging half-done research, is that someone who knows where the missing bit is to be found, can add it as a comment. The peace and mercy of God upon thee! We have seen your book … O Nabil! We have repeatedly ordered, and we now repeat that order, that the Lord of all men may not be mentioned at all in the plains of Syria, for its people are far removed from the shores of nearness and are deprived of the sealed wine of heavenly grace. Their country is extremely blessed, while its creatures are utterly deprived. I am grateful to Naeem Nabiliakbar for locating this tablet. I have modernized the spelling in the Persian, by writing به as a separate word. Since Baha’u’llah says that he has repeated this instruction many times, we may hope that other instances will be found, and that one of them may be more informative. 1. What or where is the exact place “plains of Syria”? 2. Is this/these place/s include/s Mount Carmel and its surrounding areas? 3. What is meaning of the phrase “shores of nearness”? 4. What is the meaning of the phrase “sealed wine of heavenly grace”? 5. What is the meaning of the phrase “utterly deprived”? And of what? 6. What will be the effect/s of the above reasons cited by Baha’u’llah to the Faith? That He repeated ordered the early Baha’is not to teach the Cause or to mention His name in the said place/s? 7. Are the said reason still existing today? considering the socio-political history and the current peace and security scenarios of the place? 8. Considering question No. 7, do you think it will be wise or unwise to teach the Cause of Baha’u’llah or to mention His name in that area? If we could answer these questions wisely and scholarly manner then, I think, we can have a reasonable and spiritually guided conclusion whether to teach the Faith or to mention His name in the said place/s. In those days the Fatimid caliphs ruled over Egypt and some countries to the West, and most of the time the kings of Syria, that is the Seljuqs of the plains of Syria, were also obedient and submissive to them. Briefly, the kings of Europe with their numerous armies invaded the plain of Syria and Egypt, and there was continuous warfare between the kings of the Syrian plains and the kings of Europe for two hundred and three years. So “plains of Syria” is defined as an area ruled by one of the Seljuq dynasties, under the loose tutelage of the North African Fatamid dynasty, and later subject to the Crusader invasion. Fatamid control of the Levant extended far to the North at one time, but as the Turkic peoples expanded south, Fatamid control withdrew to the South. The Seljuq dynasty concerned would be the Zengids, and presumably refers to the situation after the splitting of the Zengid territory into the Western (Syrian) and Eastern (Iraqi) lands. But that doesn’t narrow down the northern boundary of the plains of Syria much, since their rule extended North of Aleppo. The extent of the Crusader conquests also does not narrow the boundaries, because their conquests extended far north, in the County of Edessa, although they did not extend far inland (see this map). My guess from what I know so far, is that “plains (bariyyeh) of Damascus” (I’ve translated it, “plains of Syria”) refers to a wide area, more extensive than the region around a major city (balad), and is quite likely meant as a Persian/Arabic translation of the Turkish word beglerbeglik or beylerbeylik (province). The theme is a familiar one in Sufi terminology: the lover in search of the Beloved walks, using effort and reason, as a stranger through many lands, until he reaches the shore of a sea, and there he must abandon reason and plunge into the sea of love. This is discussed for example by Hakim Majdud b. adam Sana’i, in Hadiqat al-Haqiqa va shari‘at-al- Tariqa. Ahmad Ghazali, in his Resaleh dar Savaneh, says “The far boundary of the intellect is the shore of love… if the mystic traveler takes one step further, he will drown.” And drowning is precisely the intention ! and “Are these places include Mount Carmel and its surrounding areas?”, respectively. I will be glad to hear opposing and additional views/points which what have not been otherwise discussed in this presentation. After we exhaust these two important points thereupon we will proceed to others crucial points mentioned-above. As far as my understanding of socio-political history permits me, during those times at the height of Syrian conquest it annexed vast territories in the Middle East to their kingdom which includes the most lands of the present day Syria, with its capital city Damascus, areas of the present day Lebanon , areas of the present day Jordan and including among others important provinces of what is now within the territory of state of Israel, since this country geographically came into existence only as a state sometime 1948; these are the provinces of Galilee, Samaria and Judea including the important cities of Jerusalem, Haifa and Akka (or Acre or Akko) either historically as a direct province of Syria or during Roman Syria or Ottoman Syria, which the latter occupation/administratorship happened during the advent of the Hazrat Baha’u’llah and during which, probably, between 1868 when He arrived at Akka and 1892 the year of his passing away, the above-mentioned Message/Part of the Tablet was penned. I am in agreement with the idea you have stated in the last paragraph that the “plains of Syria” at that time logically means to become, in my understanding and own words, the “provinces of Syria” and does not connotes the idea to mean any particular place or communities or inhabitants within the territories of the vast kingdom Syria between 1817 to 1892 the years of ministry of Hazrat Baha’u’llah. In that Message, I think Hazrat Baha’u’llah must have specially referred to the important provinces of the ancient and sacred areas, now within the territory of Israel, of Samaria, Judea and Galilee and this made evident by what has been stated in the Message that “Their country (definitely referring to Syria) is extremely blessed…”. I don’t think that there are areas in the kingdom of Syria, at that time and even up to now, other than I have mentioned which are “extremely blessed” than those religious and sacred sites located in those provinces, especially the place of Akka, where He resides or was having His in-house imprisonment, and Haifa, which He visited thrice between 1883 and 1891. In other words, what had been impliedly stated is, probably and within this context, that “this country-Syria is extremely blessed because of those sacred sites/areas” and not for sure referring to the whole kingdom or all the provinces of Syria. Why mentioned “plains of Syria/Damascus” or “provinces of Syria/Damascus” and not “Israel”? The word “Israel” and Israel as a state/country was obviously non-existent in those days, and as I have mentioned, they became only as a country or state in the year 1948 following the declaration of David Ben-Gurion for independent state of Israel. In this connection, it is worthy to mention the contemporary of Baha’u’llah Nicholas Michell (1807-1880), a Cornish writer and a poet, who wrote the “Ruins of Many Lands”, a collection of poems, including poems written about the different famous and sacred sites in the now Israel and the title of the poems usually preceded by the name of the country which the site can be found e.g. “Syria: Galilee”, “Syria: Samaria, Ruins of Sebaste”, “Syria: Jericho”, “Syria: Plain of Esdraelon” etc. 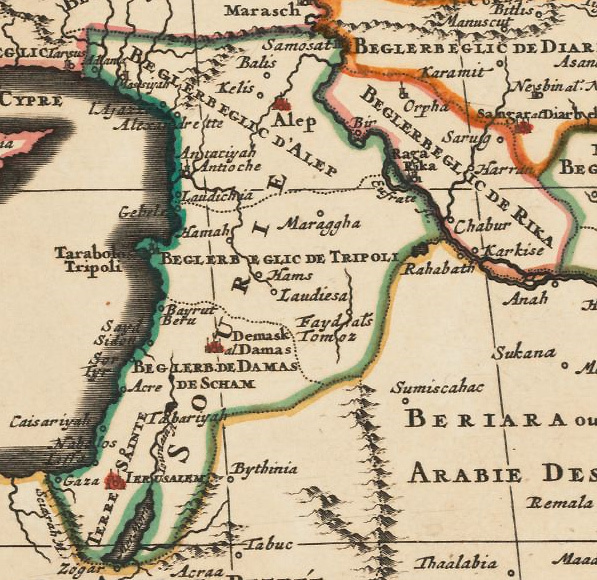 These reasonably indicates, within the connotation and understanding of the people in those times, that those areas are within Syria’s kingdom or province and Hazrat Baha’u’llah must have specifically referred to them when He said “plains of Syria/Damascus” which may not include probably other areas in the kingdom or provinces of Syria. But the fact that Hazrat Baha’u’llah has given repeated order, which in my understanding, has prophetic implication to forestall any Baha’I in the future who might be tempted to teach the Cause/Faith in those prohibited areas the reasons for which cannot be discernible and foreseeable by ordinary human being during those times and immediately thereafter but which are now readily discernible and grossly apparent in the light of upheavals that is happening today with the strife in Syria and social-racial-political conflict in Israel. As a side note, this is precisely one of the factors that the message of the Rasool/Messenger/Manisfestation should be complied and obeyed first because of their prophetic vision and the compelling power of their spiritual precepts which these capabilities are not usually accessible to ordinary human being and this moral had been repeatedly elaborated countless times in all the scriptures of the world. 1. It includes the most lands of the present day Syria, with its capital city Damascus, areas of the present day Lebanon, areas of the present day Jordan and including among others important provinces of what is now within the state of Israel; these are the provinces of Galilee, Samaria and Judea including the important cities of Jerusalem, Haifa and Akka (or Acre or Akko). 2. Hazrat Baha’u’llah has given an emphasis in areas in the provinces, among others which lie within the territory of now Israel, of Galilee, Samaria and Judea including the cities of Jerusalem, Haifa, and Akka (or Acre or Akko) when He said “Their country is extremely blessed…” because of those sacred sites. 3. Hazrat Baha’u’llah has given a prophetic and repeated order not to mention the “Lord of all men”, which is commonly understood by Baha’Is not teach the Cause or the faith, in the “plains of Syria” to mean areas mentioned in no. 1 and especially those areas in no.2. 1. Hazrat Baha’u’llah has given an emphasis in areas in the provinces, among others which lie within the territory of now Israel, of Galilee, Samaria and Judea especially the cities of Jerusalem, Haifa, and Akka (or Acre or Akko) when He said “Their country is extremely blessed…” because of those sacred sites and have warned the Baha’is in advance about its adverse impact of introducing the “Lord of all men” to those sacred spots specifically Mt. Carmel (Haifa) and Akka (or Acre or Akko) . 2. So Hazrat Baha’u’llah has given a prophetic and repeated order not to mention the “Lord of all men”, which is commonly understood by Baha’Is not teach the Cause or the Faith, in those areas and/or its surrounding areas. So we have two possible conclusions mentioned and somebody should help me out to decide for the exact one. But if there is another meaning or interpretation for “plains of Syria” I welcome that idea for discussion. I think even if there are numerous tablets, regarding the said order made in repetition, even if spoken on different occasions, to different people and with different words, it may vary not in the essence of the message, which will remain the same, but on the account probably in the translation and interpretation. A Rasool/Messenger/Manifestation of Godhead/Allah is not the one that will say one statement over one thing/fact and will say another contradictory statement over the identical thing/fact in different occasions for they are, it is said, the mouthpiece of Godhead/Allah, who is the source of all perfections and transcends kala (time) and He himself is the Kala (time), hence, they are devoid of human frailties and limitations and the messages over the same topic/subject-matter will essentially remain one and the same. In addition to this, and will lead us to draw a solid and logical conclusion that the import of these orders/tablets is identical, is the fact that Hazrat Baha’u’llah was very much aware that there were previously the same orders made in different occasions (“… O Nabil! We have repeatedly ordered…”) which He now stressed to repeat the same order (“…we now repeat that order”) is already a strong indication that the order, which is about to be made in repetition, will substantially remain the same and its import essentially one with the previous orders. In other words, in my understanding, the order to be given now by Him, whom He stressed with stern warning, and which has become the subject-matter of this discussion, will only be the repetition of the previous ones, therefore, to produce the remaining tablets will be reasonably repetitive, as well, applying, to my mind, the micro-macrocosmic principle that the qualitative knowledge of the single drop of the ocean is identical with the qualitative knowledge with other drops in the ocean and even the whole ocean itself. Granting that there will be difference or change in the import or meaning of the new order than the former ones made on other occasions then it will be, in a usual manner, expressly so stated in the new message/tablet and relevant to this are the Quranic passages that “God doeth whatsoever He willeth and ordaineth whatsoever He pleaseth” and “He shall not be asked of His doings”. There are obviously numerous scriptural or Holy Writings’ account of abrogations and changes made on past messages by the latest dispensation, especially in the aspect of Social Laws, and with the special reference to the glaring differences and changes in laws made by Hazrat Baha’u’llah between the dispensations of the proximate appearances of twin manifestations Hazrat The Bab and of His Own. If you find this idea not satisfactory to deal with the dilemma, then, it will be more appropriate of course to produce the remaining tablets which will also be beneficial for the discussion for the radiance of more than one lamp is better than one. But I am also thinking that you can keep the other remaining tablets over the same topic for time being to allow me to finish with my own interpretation base on my humble and limited understanding but most importantly on research facts along with supports from Holy Writings to allow me to find out whether I am on the right path or off-course a little bit and can thus have a sort of self-reorientation. The choice is yours. It runs also within my humanly understanding, for even the man of sound judgment will logically think also in that manner; if there are so much diseased persons in those areas why deny them the presence of the spiritual physician and the potent elixir of life, the very thing that will cure them? This presupposes, in my thinking, a solid and sufficient reason to off-set or counter weigh the deduced question but, nevertheless, allow me to continue with this sort of insignificant discussion and research just for passing the time and may be along the road, or from those who wish to contribute their own ideas in this discussion, we might be able to find answer to our inquiring minds but I have gut feelings also, and I believe, that the remaining aforementioned points are decisive in providing answer to it and the rest will be for our own satisfaction and independent investigation and judgment. 1. To who is this referring to “Lord of all men”? 2. What is meaning of the phrase “shores of nearness”? 3. What is the meaning of the phrase “sealed wine of heavenly grace”? 4. What is the meaning of the phrase “utterly deprived”? And of what? The meaning of “shores of nearness” was already discussed in your previous post, if you have the meaning or interpretation for the “sealed wine of heavenly grace”, then you may post it in advance so that I might get the hint, where I can easily start my own research, from the information you will share. Get out your Old Testament on this one…This is one of those mysteries that are found there-AbdulBaha told us to seek and solve these mysteries found in Bible etc…I will throw a pebble in the pond… Has somthing to do with Assyrians (Syria) in old days,and is connected with today?? ….. I guess it does not limit to Palestine of the day; but also the Capital City of Ottoman was included in the territories where the teaching of the Faith was prohibited by the Central Figures of the Faith. There is a Tablet of Abdu’l-Baha addressed to a Aqa Nasrullah, residing in Constantinople, in which He says, “teaching the Faith in the city where you reside now, according to implicit text, due to some hidden wisdom, was prohibited. If anybody acts contrary to it, there will be thorough harms. Even if the Iranian ask about the Faith, and begs to know, you shouldn’t utter a word about it.” (ISBN 17, page 101) In this case, there must be some other reasons. When, the today Turkey was separated from the other parts of the Ottoman Empire, and the Palestine was a protectorate of Britain, I guess teaching the Faith was allowed in Turkey, but the prohibition was continued in Palestine and then in Israel. Could you give the correct title of this book please Faruq, and say whether this is your own translation or from some other source? Before I start with this meager presentation of ideas, let me begin by saying: Eternity, Knowledge and Blissfulness innately inhere in Allah and His Glory. 2. What is meaning of the phrase “shores of nearness”? But it seems to me citations of passages from major Baha’i Writings has made this topic alone rather lengthy and exhaustive one, thus, have preferred to deal with it separately. More so, that this topic is entirely separate and distinct from the rest of the nos. 2, 3 and 4, which their respective discussions will be altogether presented in my next post. Thus, this discussion will revolve around the point no. 1 that is “To who is this referring to “Lord of all men”? And it includes the sources of the said phrase, the method for search, passages containing the phrase, discussion and conclusion. The foregoing twelve major Baha’i Writings were copied pasted from the website http://baha’i.pk and are in pdf format. The search begin with by keying in the phrase “Lord of all men”, which is the subject-matter of the discussion, and each Baha’i Writing yielded the above-stated result totaling to 15. The result of the paragraphs or sentences containing the phrase “Lord of all men”, along with the title of the Baha’i Writing and the page where they could be found is hereinafter listed down. We welcome friends to come out with their own meaning of the phrase, which is the subject-matter of this discussion, found in the authentic Baha’I Holy Writings other than those already mentioned and we, likewise, welcome it for objective and scholarly discussion. A.	Epistle to the Son of wolf. 1. “O Queen in London! Incline thine ear unto the voice of thy Lord, the Lord of all mankind, calling from the Divine Lote-Tree: Verily, no God is there but Me, the Almighty, the All-Wise! Cast away all that is on earth, and attire the head of thy kingdom with the crown of the remembrance of Thy Lord, the All-Glorious. He, in truth, hath come unto the world in His most great glory, and all that hath been mentioned in the Gospel hath been fulfilled. The land of Syria hath been honored by the footsteps of its Lord, the Lord of all men, and North and South are both inebriated with the wine of His presence. Blessed is the man that hath inhaled the fragrance of the Most Merciful, and turned unto the Dawning-Place of His beauty, in this resplendent Dawn. The Mosque of Aqsá vibrateth through the breezes of its Lord, the All-Glorious, whilst Bathá (Mecca) trembleth at the voice of God, the Exalted, the Most High. Every single stone of them celebrateth the praise of the Lord, through this Great Name.” p. 25. 2. “He also testified to the Revelation of the Prophets and the holy ones, and recognized what had been written down in the Books of God, the Lord of all men.” p.45. B.	Gems of Divine Mysteries. C.	Gleanings from the Writings of Baha’u’llah. 1. “Whoso hath, in this Day, refused to allow the doubts and fancies of men to turn him away from Him Who is the Eternal Truth, and hath not suffered the tumult provoked by the ecclesiastical and secular authorities to deter him from recognizing His Message, such a man will be regarded by God, the Lord of all men, as one of His mighty signs, and will be numbered among them whose names have been inscribed by the Pen of the Most High in His Book. Blessed is he that hath recognized the true stature of such a soul, that hath acknowledged its station, and discovered its virtues.” p. 113. 2. “Know thou that, according to what thy Lord, the Lord of all men, hath decreed in His Book, the favors vouchsafed by Him unto mankind have been, and will ever remain, limitless in their range.” p. 133. D.	The Hidden Words of Baha’u’llah. E.	The Kitab-i-Aqdas (The Most Holy Book). 1. 165 O concourse of divines! When My verses were sent down, and My clear tokens were revealed, We found you behind the veils. This, verily, is a strange thing. Ye glory in My Name, yet ye recognized Me not at the time your Lord, the All-Merciful, appeared amongst you with proof and testimony. We have rent the veils asunder. Beware lest ye shut out the people by yet another veil. Pluck asunder the chains of vain imaginings, in the name of the Lord of all men, and be not of the deceitful. Should ye turn unto God and embrace His Cause, spread not disorder within it, and measure not the Book of God with your selfish desires. This, verily, is the counsel of God aforetime and hereafter, and to this God’s witnesses and chosen ones, yea, each and every one of Us, do solemnly attest. p.40. 2. From medium obligatory prayer: “Lo, the All-Possessing is come. Earth and heaven, glory and dominion are God’s, the Lord of all men, and the Possessor of the Throne on high and of earth below!” p 48. F.	The Kitab-i-Iqan (The Book of Certitude). G.	Prayers and Meditations by Baha’u’llah. 1. “Lauded be Thy name, O Lord my God! Thou seest how I have turned myself toward Thee,and set my face in the direction of Thy grace and Thy gifts. I implore Thee, by Thy name through which Thou didst enable all them that have recognized Thy unity to partake of the wine of Thy mercy, and all such as have drawn nigh unto Thee to quaff the living waters of Thy loving-kindness, to rid me entirely of all vain imaginings, and to incline me in the direction of Thy grace, O Thou Who art the Lord of all men!” p. 189. 3. “O CONCOURSE of archbishops! He Who is the Lord of all men hath appeared. In the plain of guidance He calleth mankind, whilst ye are numbered with the dead! Great is the blessedness of him who is stirred by the Breeze of God, and hath arisen from amongst the dead in this perspicuous Name.” p 26. I. The Seven Valleys and the Four Valleys. J. The Tabernacle of Unity. K.	Tablets of Baha’u’llah revealed after the Kitab-i-Aqdas. 1. From Ishraqat (Splendour): “Fear ye the All-Merciful, O people of the Bayán, and commit not that which the followers of the Qur’án have committed—they who in the daytime and in the night season professed belief in the Faith of God, yet when the Lord of all men did appear, turned aside from Him and pronounced so cruel a sentence against Him that, on the Day of Return, the Mother Book sorely bewailed His plight. Call ye to mind and ponder upon their deeds and words, their stations and merits and the things they brought to pass when He Who conversed on Sinai unloosed His tongue, when there was a blast on the Trumpet, whereupon all that are in heaven and on earth swooned away except such as are reckoned among the letters of affirmation.” p. 38. 2. “We are quit of those ignorant ones who fondly imagine that Wisdom is to give vent to one’s idle imaginings and to repudiate God, the Lord of all men; even as We hear some of the heedless voicing such assertions today.” p. 60. 3. “O people of the Bayán Fear ye the All-Merciful, O people of the Bayán, and commit not that which the followers of the Qur’án have committed—they who in the daytime and in the night season professed belief in the Faith of God, yet when the Lord of all men did appear, turned aside from Him and pronounced so cruel a sentence against Him that, on the Day of Return, the Mother Book sorely bewailed His plight. Call ye to mind and ponder upon their deeds and words, their stations and merits and the things they brought to pass when He Who conversed on Sinai unloosed His tongue, when there was a blast on the Trumpet, whereupon all that are in heaven and on earth swooned away except such as are reckoned among the letters of affirmation.” p. 39. L.	The Summons of the Lord of Hosts. We have extracted passages the paragraphs or sentences of which incorporate the phrase “Lord of all men”, which is principally the subject-matter of this discussion, from those foregoing twelve major Baha’i Writings which, almost all of it, were revealed by Hazrat Baha’u’llah Himself and have yielded results which could possibly resolve this question “To who is this referring to “Lord of all men”? And statistically speaking, if the translations from their original language into English language were accurate, the chances of formulating an exact interpretation or answer would be highly probable for the fact that the major Baha’i Writings were already included in the search for the said phrase. I have intimated in my previous post that there are three possible answers to the said question, firstly, God/Allah/Rabb/Khoda, secondly, Baha’u’llah and, lastly, as I have previously stated “it might be referring to both of them in separate instances depending on the surrounding circumstances it was said relying heavily on passages from Holy Writings as support” and true to that conviction are those citations of several passages from the twelve major Baha’I Writings from which this discussion hinges. The word “Lord” which is a translation of the Arabic word “Rabb” in the Qur’an and it was expressly stressed in the said Book as referring to Allah and Himself alone and does not refer to Prophet Muhammad himself or to any previous rasools. This was emphasized repeatedly in the Qur’an to cite from the said Book “The fact is that your Rabb is the same Allah Who created the heavens and the earth…” (Qur’an 10:3) and more so with the whole phrase “Lord of all men”, which would only falls squarely within the context of the Qur’an describing one of the limitless spiritual attributes of Allah i.e. sovereignty (mulk) over the whole universe, definitely refers to Allah Himself and not to His Rasool Prophet Muhammad. It is noteworthy that the word “Allah” is not a personal name of the deity but an Arabic conjunctive word of “Al illah” to become “Allah” which means “the God”. In other words, in ordinary parlance the mentioning of word “God” has its equivalent Arabic word and that is “Allah”. I have raised this point which might be helpful to clarify the concept of manifestation of God/Allah and of God/Allah Himself later on. Going back to the phrase, if we refer that concept to a Christian belief, and by applying same, then we will find ourselves in Trinitarian Gordian knot of pointless and endless debates and arguments beginning from the formation of the counsel at Nicaea on 325 A.D. convened by Constantine to resolve the escalating conflicts and controversies within his kingdom about the personality of Christ and to cast votes to resolve the issue in favor of His divinity that He is the Lord and God under the trinity doctrine. On the contrary, this has been one of the major reasons for the division of the Faith espoused by Christ into numerous conflicting sects and groups/congregations having irreconcilable conflicting views on the underlying rationale and concept for the declaration of divinity of Christ which for some alleges, and also in my own opinion, such claim does not have a clear cut support from the Biblical passages and are mere conjectures and suppositions. What was clear at the end of it all, and to façade its crippling inability to pin point direct evidence from Holy Writings, is that its proponents emphasized absolute obedience to the religious authorities. Truth, cognizable through knowledge, is the foundation of the both science and religion can never be made clear nor modify through majority vote nor i.e. the reality of third law of motion by Newton of action and reaction be subjected to approval in a convention for its indubitable existence is as old as creation of the universe itself, and so even before its discoverer was born, but was only later on discovered by the latter whose name was only dubbed upon it. Historically wise, unfounded or baseless man-made ideas, religious dogmas and doctrines, which were later, passed on authoritatively and forcefully to become as different religions or its dogmas, oftentimes, result in confusion and strife, and eventually into arms conflict which is the source of all-devouring fire of hatred and vendetta at the cost of countless lives and sufferings for mankind, as it is based on half truth or superficial truth which, most often, were propagated for the sinister intention of controlling men’s free will for power support and usurpation and it runs counter to the famous religious tenets “kingdom is God’s”, as contradistinguished with the bona fide translations and interpretations of Holy Writings which its essence has always been from time immemorial remains the same theme and of the its spiritual precepts of love, unity and peace as a reflection of Divine Unity-Tawhid. This concept was clearly emphasized in all the religions of the word in a deeper metaphysical or esoteric sense and in the Qur’an 2:213 it is stated that “Mankind was one nation having one religion. Later when people invented other religions, Allah appointed Prophets as bearers of good news and Warnings: and revealed to them the Book with the True Guidance to settle the matters of dispute between mankind” and, likewise, in this Baha’i dispensation the teaching of unity is the central and primary tenet and is very much clear and apparent in all Baha’i Writings as mankind’s advance intellectually, spiritually and materially and as the earth shrinks to become a global village. But the crucial point remains, since Hazrat Baha’u’llah’s revelation has its inception in Persia with its Shia’s and Shaykhis’ environment which is its probable influence, along with its sunnahs, hadiths and oral traditions elaborating literally and metaphysically the tenets of Quran, is this kind of thinking in Quranic context also hold true with the Baha’i Writings revealed by Baha’u’llah Himself? Or in other words, does this phrase “Lord of all men” refers exclusively to Allah/God Himself alone and not to Hazrat Baha’u’llah in this Baha’i dispensation? 2. From Ishraqat (Splendour): Fear ye the All-Merciful, O people of the Bayán, and commit not that which the followers of the Qur’án have committed—they who in the daytime and in the night season professed belief in the Faith of God, yet when the Lord of all men did appear, turned aside from Him and pronounced so cruel a sentence against Him that, on the Day of Return, the Mother Book sorely bewailed His plight. Call ye to mind and ponder upon their deeds and words, their stations and merits and the things they brought to pass when He Who conversed on Sinai unloosed His tongue, when there was a blast on the Trumpet, whereupon all that are in heaven and on earth swooned away except such as are reckoned among the letters of affirmation. p. 38. In the first passage has a direct bearing on the topic being discussed because “Syria” was also mentioned on it and the word was probably used in the same context when Hazrat Baha’u’llah made that repeated order “that the Lord of all men may not be mentioned at all in the plains of Syria”, it says “The land of Syria hath been honored by the footsteps of its Lord, the Lord of all men, and North and South are both inebriated with the wine of His presence”. This passage clearly negates the idea that the phrase “Lord of all men” is referring only to God/Allah, the Unknowable Essence. Exegetically, God/Allah has three important and irrefutable attributes of omnipresent, omniscient and omnipotent and if we interpret that to mean that God/Allah, the omnipresent, has made His footsteps in Syria then that would be a blatant absurdity. If God/Allah has made footsteps in Syria then logic will compel us to draw more hypothetical, but a reasonable, conclusions that He made His footsteps also in Pakistan and everywhere in the world and in universe in the past, present and in the future being omnipresent all the time. This will render that passage meaningless and complete fallacy for the fact that God/Allah has already made His “footsteps” even before it has, at that time, been called “Syria” and, thus, will only become a source of inordinate arguments to support the interpretation over the said whole passage. Further, in ordinary common parlance, footsteps is generally referred to impressions made by corporeal man as he walks on the any surface except if that word was used in a figurative sense which will have, of course, a different imports but this is not the case in that passage. The “Land of Syria” is a real and existing tangible surface, a country, at the time when the message was revealed and so the “footsteps” by a corporeal being over it are likewise real and literal. We have already exhaustively discussed and we have pointed out in my first post/presentation that the “plains of Syria” was referring to areas which include areas, among others, within the present-day Israel, especially the sacred sites of Jerusalem, Mt. Carmel and Akka (Akko or Acre) and this passage has further clarified that arguments and probably has restricted the meaning to those sacred sites and its surrounding areas only where Hazrat Baha’u’llah was serving His in-house imprisonment in Akka (Akko or Acre) beginning from 1868 until His passing away in 1892 and Mt. Carmel, when He visited it thrice between 1883 and 1891. In other words, it is a common knowledge among Baha’is that Hazrat Baha’u’llah has made His “footsteps” or “presence” in those sacred areas formerly called the “Land of Syria” now within the territory of present-day Israel and for that reason He has probably dubbed the country “Syria” as “extremely blessed” because of those sites and, thence, the phrase “Lord of all men” is definitely referring to Hazrat Baha’u’llah and not to the omnipresent God/Allah. Further, this is supported by the fact that the “North and South are both inebriated by the wine of His presence” and as what we have pointed out that Hazrat Baha’u’llah has made His presence there and that would constitute a more reasonable interpretation that the passage is referring to Him. If we again suppose to mean that it refers to God/Allah then we might be again compelled to conclude that He might be as well made His presence in any specific place on earth and in the universe and the idea will again become absurd and meaningless owing to the fact that He is already, not only in the “North” and in the “South”, but everywhere on earth and in the universe at any given time being omnipresent even before Hazrat Baha’u’llah has made His presence in that place. So what had appeared before the followers of Bayan/Islam was Hazrat Baha’u’llah (or Hazrat The Bab) which the followers of Hazrat The Bab had been sternly warned about the attitude of the followers of Islam that they profess their firm Faith in His religion day and night yet they prosecuted Him, Hazrat The Bab (or Hazrat Baha’u’llah). Likewise, it is critically important to point out that if the “Lord of all men” is referring to God/Allah, the omnipotent, omnipresent and omniscient Lord, the Unknowable Essence, has appeared before the eyes of men, then, it will be an apparently illogical to pronounce a “cruel sentence” against Him. Nobody has ever seen the Unknowable Essence God/Allah nor those who even posed themselves as judges against the messenger/manifestation of God/Allah has made a direct contact with Him much more has the capability, no matter how numerous are they and is in possession of abundant powers that all the people on earth can amassed, to pronounce a cruel sentence on Him but rather they have heard only God/Allah from the mouth of those Holy Beings and have become only fearful and insecure about the impact of their Word on the intoxicating positions they hold and on their wielded powers. Further, He is the source of Justice and He is also the One pronouncing Judgment according to men’s doings and “He shall not be asked of His doings”. It is an undoubted fact that both Hazrat Baha’u’llah and Hazrat The Bab has been pronounced with so cruel a sentence during their years of ministry, hence, the Lord of all men which appeared before the eyes of men and has been pronounced with a “cruel sentence” by men also was unquestionably referring to Hazrat Baha’u’llah (or Hazrat The Bab). “The knowledge of Him, Who is the Origin of all things, and attainment unto Him, are impossible save through knowledge of, and attainment unto, these luminous Beings who proceed from the Sun of Truth. By attaining, therefore, to the presence of these holy Luminaries, the “Presence of God” Himself is attained. From their knowledge, the knowledge of God is revealed, and from the light of their countenance, the splendour of the Face of God is made manifest. Through the manifold attributes of these Essences of Detachment, Who are both the first and the last, the seen and the hidden, it is made evident that He Who is the Sun of Truth is “the First and the Last, the Seen, and the Hidden.”* Likewise the other lofty names and exalted attributes of God. Therefore, whosoever, and in whatever Dispensation, hath recognized and attained unto the presence of these glorious, these resplendent and most excellent Luminaries, hath verily attained unto the “Presence of God” Himself, and entered the city of eternal and immortal life. Attainment unto such presence is possible only in the Day of Resurrection, which is the Day of the rise of God Himself through His all-embracing Revelation. Page 44. Suffice it to say, to have recognized and attained the presence of the messenger/manifestation is also to have attained the presence of God/Allah and this concept has support, according to the best of my knowledge, Biblically and to quote the passage “whoever accepts me, accepted Him the father who sent me”. So in esoteric or metaphysical sense, “seeing”, “attaining the presence of” and “meeting” Holy Beings is the same as “seeing”, “attaining the presence of” and “meeting” God/Allah. This concept appeared to be generally strange and foreign to Christianity and Islam or it might be that it was not previously made clear due to conflicting assertions of religious authorities of their self-claim patented exclusivity over their own self-imagined dogmas and doctrines which made the concept rather hazy and materially tinged but was now made clear by the appearance of the twin manifestations of Hazrat The Bab and Hazrat Baha’u’llah as mankind is now ready to grasp, formerly hidden esoteric and metaphysical knowledge, as it evolves spiritually and materially. Thus, by putting this phrase “Lord of all men” into that holistic discussion through citations of relevant spiritual precepts and concepts especially from Writings of Hazrat Baha’u’llah, since spiritual precepts are like “pearls strung on a thread” which can be best understood when enhance into an interrelated wider spiritual views, we can now clearly see, and have started to entertain the idea of the possibility of usage, that the phrase might be in certain occasions or circumstances referring to, not only exclusively to God/Allah, the Unknowable Essence, but to His rasool/manifestation/messenger, as well, who are qualitatively and essentially possessing those of God/Allah from the standpoint of the “station of essential unity” and the three passages we have cited above are but proofs of such usage. From the discussion, we can now conclude that the phrase “Lord of all men” generally means God/Allah/Rabb but in certain occasions it might be referring to the Baha’u’llah depending on the whole context or according to the spirit, and not to the letters, of sentence or paragraph of the passage where it is found. My next post will devolve on the discussion on point no. 2, 3 and 4 as we have pointed out on the foreword. I will feel much better to hear opposing views or opinions on this matter and to put that into discussion which Abdu’l’Baha has encouraged such discussion when he the Master has stressed, in one of his Writings, that from the clash of opinions the finer spark of truth comes out. Please feel free to do so. Thanks. ‘These people of Israel are even unto the present day still expecting that Manifestation which the Bible hath foretold! How many Manifestations of Holiness, how many Revealers of the light everlasting, have appeared since the time of Moses, and yet Israel, wrapt in the densest veils of satanic fancy and false imaginings, is still expectant that the idol of her own handiwork will appear with such signs as she herself hath conceived! Thus hath God laid hold of them for their sins, hath extinguished in them the spirit of faith, and tormented them with the flames of the nethermost fire. And this for no other reason except that Israel refused to apprehend the meaning of such words as have been revealed in the Bible concerning the signs of the coming Revelation’ Kitab i Iqan p. 18 Bahai Reference Library. Another self opinion different from the one earlier in the thread is that As Bahaullah considering Him GOD, He is punishing still more ISRAEL. And as a retribution debar them from accepting His faith even if they wish to do so. Where is the wisdom? I don’t know. Or did Bahaullah wished that Israel as a new built nation, as told in biblical prophesies, have a self recognition to his faith to break the curse laid on them. Why GoD so cruel only against one nation in the whole world.???? I think you are forgetting that, in the time of Baha’u’llah, the word Israel meant the Jewish people, particularly those practicing the Jewish faith, while the inhabitants of Palestine at the time were Muslim, Christian, Druze and a small minority of Jews and Samaritans, all living under the rule of the Ottoman Turks. So what he says in the Iqan about “Israel” has no apparent connection to the fact that Bahais did not teach in “Syria” (including Palestine) and that today do not teach any of the inhabitants of Israel — Jews and Muslims and secular people alike. In a Turkish letter to Abdülhamid – to my knowledge the only letter directly addressed to the Sultan – the Baha’i leader talks about the imperial decree ‛that has been issued recently’ concerning his confinement in ‛Akka. ‛Abdu’l-Baha most probably wrote his letter as a response to the renewal of his imprisonment in 1901. He says that ‛no dishonorable condition and act contrary to the imperial will has manifested itself on my behalf or our community’ and assures the emperor that he and his followers are his loyal subjects who ‛hesitate to meddle in the affairs of the government (umur-i hükûmet) and the transactions of the people (muamelât-ı ahali)’, as required by Baha’i principles (non-involvement in partisan politics). … ‛nothing has been undertaken to attract and admit even a single individual from among the Ottoman subjects to join our tarikat during our lengthy stay in ‛Akka for more than thirty years’. This does not directly prove that the original purpose of Baha’u’llah’s ruling was to avoid upsetting the Ottoman authorities. That point might be an incidental benefit, 30 years later. But it indicates (as I had suspected) that the ban on teaching the Faith was originally very broad — Ottoman subjects being most of the permanent residents of the Ottoman empire — and that does suggest to me that the reason had then (and still has) something to do with relations with the government. And God knows best. I am not forgetting and you are right to say that the word Israel apply for the Jews. Only and only for the Jews. The land is the Promised land by God to the Jews as foretold in the Books. God have fulfill His promise and now is left to the people of Israel to do theirs. No other land on this entire planet has been promise to a particular nation and now they are a Nation. God through His messenger I think is expecting from the Jews a self and full recognition to His faith without having to ”door knocking”,Ruhi session etc. And the quotation from the Iqan translation is clear cut. You know there are so many writings in the Bahai faith, authored by three central figures that someone can use some writings now to approve his points and latter use other writings to refute the same points in differents circumstances. Me Too-This is a good mystery..
Folks, thank you for providing us with Persian Tablets of Baha’u’llah and Abdu’l-Baha which has greatly enriched the discussion in this thread. I am intending to continue my post on this topic but I can see in the long-run the expanse of the discussion which might involve other ancillary topics but may help us understand it from better perspective and currently I am doing a research on this subject-matter for which I am requesting the friends if they can provide me with all the Persian Tablets of Hazrat Baha’u’llah and Abdu’l-Baha together with English translations, and also of the messages of Shoghi Effendi and Universal House of Justice relevant to the Prohibition Policy and you may send it to my email address at rgumban@yahoo.com or you may post it here at your choice and convenience. After I am done with it I will probably send it back to you for review or I may post it here again for further discussion. It is about political issue, I heard from a distinguished Persian bahá’í who was the secretary of Shoghi Effendi, who served at the ITC, was a Counselor and a great bahá’í teacher, that in the future the first country to adopt the Bahá’í model will be Israel. That’s hearsay, and requires the supposition that Shoghi Effendi could see future events. But Shoghi Effendi himself says “Though overshadowed by the unfailing, the unerring protection of Bahá’u’lláh and of the Báb, and however much he may share with ‘Abdu’l-Bahá the right and obligation to interpret the Bahá’í teachings, he remains essentially human...” (The World Order of Baha’u’llah, p. 150). Another weakness in this explanation is that the ban on teaching in Israel is a continuation of an earlier ban, instituted by Baha’u’llah himself in the days before Israel existed. Seeing as how this discussion is centered on a quote, I believe I have a simple answer. It is common practice amongst Baha’is to not teach the Faith to people who do not want to listen. Baha’u’llah must have seen how staunch and devout the people in the “plains of Syria” were and advised his followers to look elsewhere for any who were willing to listen. There is a story of an early Baha’i in Persia. ‘He went to his hometown to preach the Faith on a street corner to all passers-by until his good friend pulled him aside and warned him that if he continued to do so, than the people will surely kill him. Obviously they did not want to listen, so maybe he should go teach in some other town.’ Of course I am largely paraphrasing. Maybe his order to not teach was contemporary to the time. Also, I just want to point this out, but just like every other UN region, excluding N. Korea and The Vatican, the Faith still grows at no less than twice the native population growth in Israel. That is an official UN statistic. “Official UN statistic” needs to be substantiated. I doubt that the UN produces statistics on small religious groups. Since, as far as I know, Baha’is are currently permitted to share their faith in most or all areas around Israel where this was formerly forbidden by Baha’u’llah, the Universal House of Justice must have felt that the policy adopted by Him was a temporary or contingent one. Therefore, this very carefully adhered to prohibition in Israel may be altered in the future. Religion, and more specifically conversion to a new religion, is a troublesome issue in many countries and it is understandable if in Israel at this time when the great majority of Israelis still feel under threat as a nation, the issue is particularly sensitive and likely to be divisive. Regarding teaching other religions in Israel, from what I have read, as recent as 2015, the Israeli penal code, enacted in 1977, bans only missionary activity that involves any “material benefit,” or is aimed at minors. Tourists to Israel (one third are now Christian evangelicals who are largely very pro Israel politically) are also legally permitted to share their religion with Israelis. The issue with the Mormons in 1984 over the building of a campus in Jerusalem was ultimately resolved with them agreeing formally not to engage in missionary activities. Many or most other American Christian organizations have followed this practise. However, the Israeli organization Yad L’Achim which campaigns vigorously against missionary activity in Israel states that the law is not enforced. While the Jewish ultra-Orthodox sects are said to “completely ignore these prohibitions in their own missionary activity”, Yad L’Achim is particularly concerned with the Jewish Messianics (converts to Christianity, e.g. Jews for Jesus) who are very publicly active in Israel, and legally so. Conservative estimates of their number is 20,000 individuals in more than 100 congregations. During Prime Minister Netanyahu’s last government, Yad L’Achim unsuccessfully pushed to have the law amended to ban such missionary activity. Thank you Maury; a very informed and informative comment. As for change in the future, I think that in the absence of a Guardian the House of Justice will be much more conservative, as it is not in a position to judge confidently what falls within its sphere of jurisdiction. At present, it would be an embarrassment to have Bahai citizens of Israel, who would be liable to military service, and would be paying taxes to support a state which is a homeland to one ethnicity, more than others.”The earth is one country, and mankind its citizens.” So whatever the original reasoning may have been, the rule has worked out rather well. Thanks Sen. As none of us are privy to the consultation of the Universal House of Justice, it is a matter of conjecture regarding its views on various subjects until we receive its written messages. Without wanting to argue the point, I think we can be confident this august institution will continue to determine what falls within their sphere of jurisdiction. That being said, some decisions are much more complex than others. The fact that the Baha’is have been given approval to expand in countries neighbouring Israel suggests such decisions have already been made. Although more research would need to be done to get all the details the fact that ‘Abdu’l-Baha knew of the growth of the Faith in Turkey during his lifetime and the Guardian in 1951 authorized formation of the first Local Spiritual Assembly of Istanbul suggests teaching had been approved by that time. I appreciate all the comments here, it is quite interesting. As we see in post #11 above, Baha’u’llah has “repeatedly ordered” not to teach the Faith in the “plains of Syria”. This clearly indicates that there are many such statements which we have not seen here, and also we have not seen the full context of each statement. From the mention in Post #28, prohibitions existed elsewhere in the Ottoman realm, which have been later removed. While I’m sure we would all like to read the full tablets of Baha’u’llah where such mentions were made so we can analyse and understand the implications, extent and context of such orders, we also should remember that the Covenant has provided clarity in terms of knowing what we should be doing or not doing. In particular, we don’t need to rely on finding every mention Baha’u’llah made on the issue, we can trust that if ‘Abdul-Baha and Shoghi Effendi enforced the prohibition during Ottoman, British and Israeli rule, it was according to Baha’u’llah’s wishes. Likewise, the Universal House of Justice at present. As to the distant future, I certainly believe that there will be a vibrant Baha’i community in the Holy Land. Perhaps there will be a definite set of circumstances that need to arrive where teaching will be allowed as specified by Baha’u’llah, or if not specified, the Universal House of Justice will be able to legislate regarding it. “we don’t need to rely on finding every mention Baha’u’llah made on the issue, we can trust that if ‘Abdul-Baha and Shoghi Effendi enforced the prohibition during Ottoman, British and Israeli rule, it was according to Baha’u’llah’s wishes. Likewise, the Universal House of Justice at present”. That is precisely what Sen does not do with this and other issues like homosexuality or monogamy.